I learned some things that shocked me. Families actually had to pay to get their family member back. If they were lucky enough to be found and identified! Families had to pay for embalming and transportation of the body home. Since the Titanic did not finish it's voyage, full pay was not sent, deductions were made for the remaining days. This is sickening. 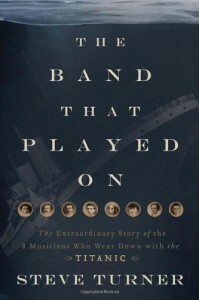 We learn about each member if the band, their background, the way they wound up onboard and where their families are today. Did they play voluntarily or was it under the order of their band leader or the captain? That is a question that will never be answered. Did they really play Nearer My God to thee as so many reported? My question.....does it really matter? Tor me, regardless of the what's and whys, these men gave their lives while trying to help others. Their playing of music no matter what kind or what songs, helped people to feel calmer in the midst of chaos. They, like the captain,went down with the ship. Only three of their bodies were recovered. They are heros. I especially liked the photos. They tell their own story about the people and places in them. The book was well researched and includes lots of interesting trivia. Recommended for any one who has an interest in the Titanic.